Most of the support material has now been removed and he doesn’t look too bad. Next step is to have the Elephanticus painted. 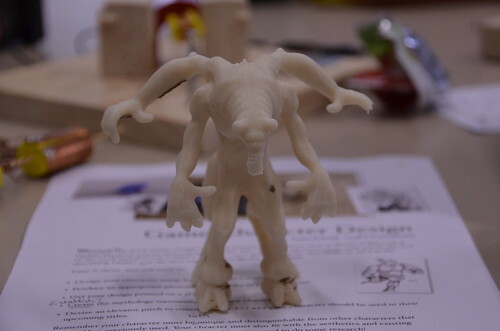 123D Creature is a new iOS app from the team at Autodesk that allows students with no previous experience to engage and experiment with 3D modelling. Creatures are the name of the game and the app provides an intuitive interface that is easy to use. Starting with a skeleton, it is very easy to add limbs, bones & joints , sculpt details much like you would if working with clay. 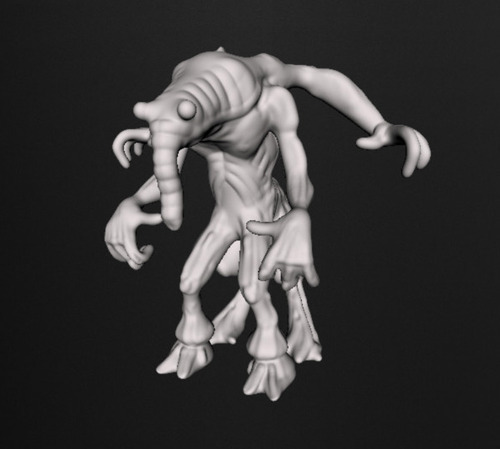 Processing your model or ‘baking’ as 123D Creature refers to it, allows you to add textures, poses, scale, colour etc. and to place your model into a background to produce photorealistic renders. Creatures can be exported in .obj format, and if you have access to a Makerbot 3D printer, you can import the .obj directly into MakerWare and start your print job. If you don’t have a Makerbot, you will need to import the .obj into blender and export as a .stl – the file format required by most 3D printers. 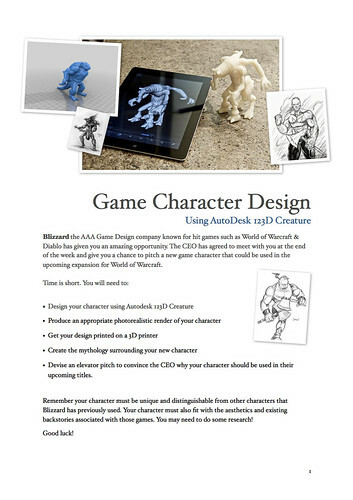 Download your own copy of this unit of work. 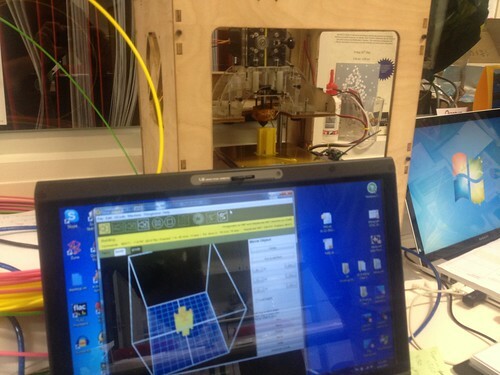 Thingiverse already has a number of exemplar models available to download. We are currently printing the Elephanticus on a Dimension 1200es series with layer resolution of 0.254mm – estimated build time of 10 hours. Will post updates when done. The salient points of the Manifesto, for me at least, are 4. & 5. 4. because it helps you overcome those moments of the fear of not knowing, the fear of failure, the feelings of not being up to the task or that someone else knows more or could do it better. 5. because it has helped overcome my Chrome tab addiction. Seriously, sometimes I would have the same 20 tabs open for a week. That’s not healthy. If you haven’t read or acted on those tabs within 7 days then you are not going to. Delete them. If it is a good idea it will find it’s way back to you. 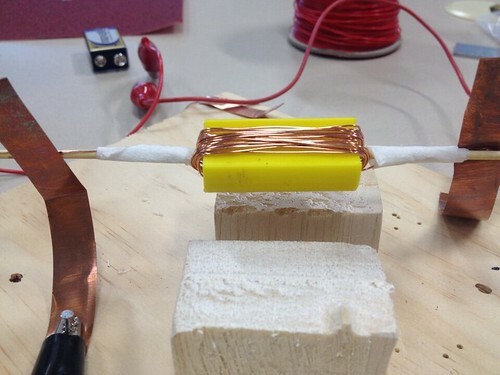 Want to make a DC Motor? Today we utilized a 3D printed split-ring commutator with adhesive copper tape making contact with the brushes. We were expecting greater efficiency, but actually got less. The copper foil we are using isn’t ‘springy’ enough – a new brush system is needed or at least some thicker copper foil. (Granted it only has 2V through it in this video) Check it out. Something else to consider when using 3D printed parts instead of balsa is that the extra weight causes the shaft to sag… If using 3D printed parts consider using something other than a wooden skewer – maybe a metallic skewer, knitting needle etc. 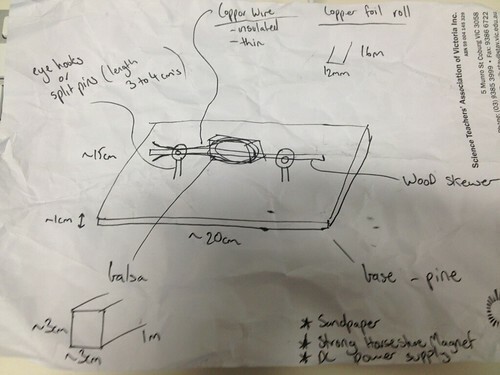 Find ‘Making a DC Motor’ Activity sheet available from download here, which also includes .skp files for the armature and commutator. *Instructions for a simpler DC motor can be found here. A rough sketch of a DC Motor. Having students construct a simple DC motor is a great way to learn about the interactions between electric & magnetic fields. The Armature is easily made by shaping some 25 x 25 mm balsa with a razor blade. Getting a nice balanced armature can be tricky and requires some patience. 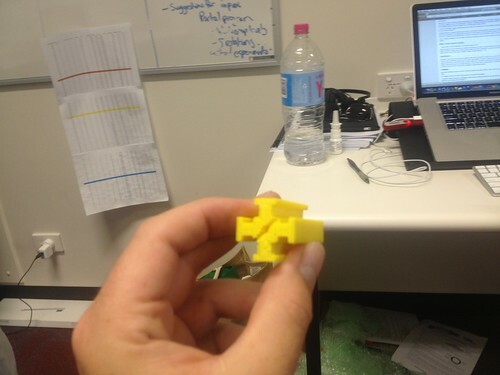 If you have access to a 3D printer you can have students design an armature using Google Sketchup. 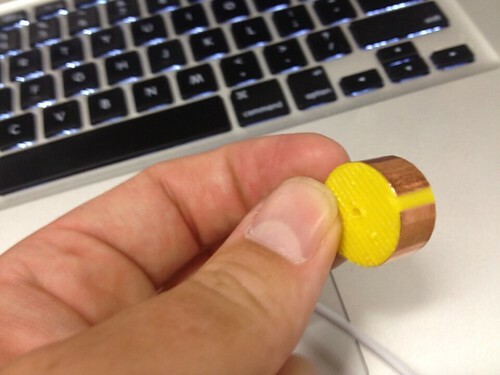 Once printed, it can be placed on the shaft and copper can be wound around the armature. Also note that the copper wire must be enamelled. The enamel then should be sanded only where the brushes make contact. The enamel works like insulation in the coil and allows a force to be generated. To create a split ring commutator with adhesive copper tape so that our motor looks a little more like an actual motor. ie.